Often it's the little touches that make all the difference. When choosing which clothes to stock, we look at attention to detail and particularly like little ideas that make life easier. Here are 5 little touches that we love. You can WIN a £20 Cambridge Baby voucher by leaving a comment, and saying which is your favourite! 1. The extendible bodysuit Babies grow quickly, so helping things last longer as your baby gets bigger is a great idea. This wool/silk sleeveless bodysuit by Iobio has two rows of poppers so it's extendible and lasts longer, and is even better at handling cloth nappies. Iobio's wrap-around bodysuit also has sleeves which can either be down as scratch mitts, with little hands tucked into them, or folded up as your baby grows. 2. Leggings with a perfect fit This perfect touch is even simpler. On all their wool and wool/silk leggings, German company Engel has included an opening on the inside of the waistband, which allows you to tighten or change the elastic without having to un-stitch anything. So if you have a narrow-waisted child, you can easily shorten it as much as you need to for a perfect fit - and should the elastic break (not that that has happened yet! ), it's easy to replace. Simple - why doesn't everyone do it? 3. Hand-stitched invisible seams Comfortable fabrics, comfortable cut and comfortable finishing create clothes that keep babies and children happy. Comfort is at the top of the list with us - from top to toe. Groedo hand-stitch the toes and heels of most of their organic cotton and wool socks and tights, creating "invisible" seams that can't be felt. So these socks and tights never rub nor feel uncomfortable! The German word for this is handgekettelt and we love this attention to detail. 4. Removable labels Youngest Good Natured Team member, Connie (aged 4) always needs labels taking out, and it is annoying when they're stitched right into the seam, making it impossible to take them out cleanly. Swiss brand Alkena make this so easy. Alkena's biodynamic silk clothes have labels lightly stitched at each side, so that they can easily be removed. Because it's so easy to do, it gets done sooner and little Connie is happier. They do the same for adults too - thanks, Alkena! 5. Stay-on hats "My little boy Phillip has worn it all day today in the park, and it fits so nicely he forgot he had it on. The design is brilliant ... and it really stays on." Mirjam, Cambridge. 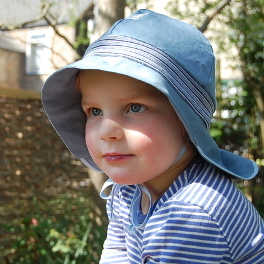 Whether they're sun hats or woolly hats, baby hats really need to stay on. We have always loved Pickapooh for making sure they do just that, with soft ties or poppers under the chin for long-lasting stayonability. "The best bit is that she forgets she's wearing it!" Lauren, Redhill, UK. And that's how all children's clothes should be. ---------------------------------- Win a £20 Gift Voucher! Comment on this or any of our blog posts in March, and we'll randomly select a winner on 1st April. Share or link to a blog post for bonus entries! This entry was posted on Wednesday, February 8th, 2012 at 1:41 pm	and is filed under our brands, our ethics, who we are. You can follow any responses to this entry through the RSS 2.0 feed. You can leave a response, or trackback from your own site.